Error handling is an essential part of RxJs, as we will need it in just about any reactive program that we write. Error handling in RxJS is likely not as well understood as other parts of the library, but it's actually quite simple to understand if we focus on understanding first the Observable contract in general. So without further ado, let's get started with our RxJs Error Handling deep dive! In order to understand error handling in RxJs, we need to first understand that any given stream can only error out once. This is defined by the Observable contract, which says that a stream can emit zero or more values. The contract works that way because that is just how all the streams that we observe in our runtime work in practice. Network requests can fail, for example. Notice also that there is no obligation for the stream to complete or error out, those two possibilities are optional. But only one of those two can occur, not both. This means that when one particular stream errors out, we cannot use it anymore, according to the Observable contract. You must be thinking at this point, how can we recover from an error then? As we can see, this HTTP stream emits only one value, and then it completes, which means that no errors occurred. As we can see, the stream emitted no value and it immediately errored out. After the error, no completion occurred. Handling errors using the subscribe call is sometimes all that we need, but this error handling approach is limited. Using this approach, we cannot, for example, recover from the error or emit an alternative fallback value that replaces the value that we were expecting from the backend. Let's then learn a few operators that will allow us to implement some more advanced error handling strategies. In synchronous programming, we have the option to wrap a block of code in a try clause, catch any error that it might throw with a catch block and then handle the error. This mechanism is very powerful because we can handle in one place any error that happens inside the try/catch block. RxJs provides us with something close to this functionality, via the RxJs catchError Operator. As usual and like with any RxJs Operator, catchError is simply a function that takes in an input Observable, and outputs an Output Observable. With each call to catchError, we need to pass it a function which we will call the error handling function. The catchError operator takes as input an Observable that might error out, and starts emitting the values of the input Observable in its output Observable. If no error occurs, the output Observable produced by catchError works exactly the same way as the input Observable. What happens when an error is thrown? However, if an error occurs, then the catchError logic is going to kick in. The catchError operator is going to take the error and pass it to the error handling function. That function is expected to return an Observable which is going to be a replacement Observable for the stream that just errored out. Let's remember that the input stream of catchError has errored out, so according to the Observable contract we cannot use it anymore. This replacement Observable is then going to be subscribed to and its values are going to be used in place of the errored out input Observable. As we can see, the replacement Observable was used to provide a default fallback value () to the subscribers of http$, despite the fact that the original Observable did error out. Notice that we could have also added some local error handling, before returning the replacement Observable! And this covers the Catch and Replace Strategy, now let's see how we can also use catchError to rethrow the error, instead of providing fallback values. Let's start by noticing that the replacement Observable provided via catchError can itself also error out, just like any other Observable. And if that happens, the error will be propagated to the subscribers of the output Observable of catchError. As we can see, the same error was logged both in the catchError block and in the subscription error handler function, as expected. Notice that we can use catchError multiple times at different points in the Observable chain if needed, and adopt different error strategies at each point in the chain. As we can see, the error was indeed rethrown initially, but it never reached the subscribe error handler function. Instead, the fallback  value was emitted, as expected. The finally block is typically used for releasing expensive resources, such as for example closing down network connections or releasing memory. RxJs provides us with an operator that has a similar behavior to the finally functionality, called the finalize Operator. Notice that the last finalize block is executed after the subscribe value handler and completion handler functions. As an alternative to rethrowing the error or providing fallback values, we can also simply retry to subscribe to the errored out Observable. Let's remember, once the stream errors out we cannot recover it, but nothing prevents us from subscribing again to the Observable from which the stream was derived from, and create another stream. The big question here is, when are we going to subscribe again to the input Observable, and retry to execute the input stream? are we going to retry that immediately? are we going to wait for a small delay, hoping that the problem is solved and then try again? are we going to retry only a limited amount of times, and then error out the output stream? Observable that is going to determine when the retry attempt occurs. 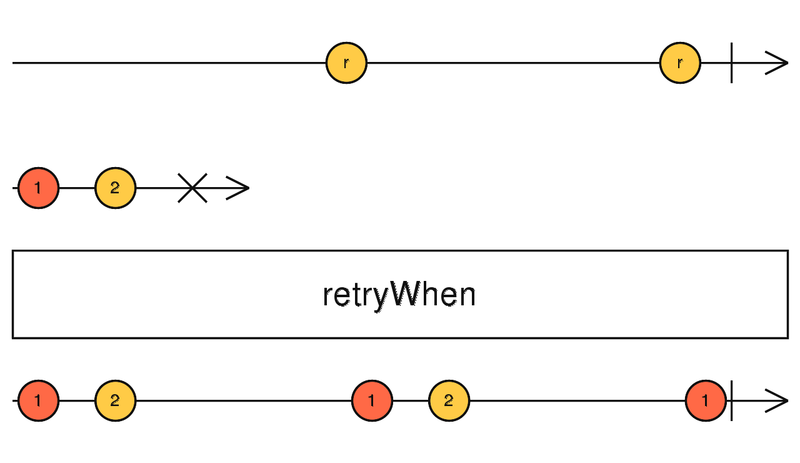 The Notifier Observable is going to be used by the retryWhen Operator, which is the heart of the Retry Strategy. Notice that the Observable that is being re-tried is the 1-2 Observable in the second line from the top, and not the Observable in the first line. The Observable on the first line with values r-r is the Notification Observable, that is going to determine when a retry attempt should occur. As we can see, retryWhen simply retries the input Observable each time that the Notification Observable emits a value! Now that we understand how retryWhen works, let's see how we can create a Notification Observable. We need to create the Notification Observable directly in the function passed to the retryWhen operator. This function takes as input argument an Errors Observable, that emits as values the errors of the input Observable. So by subscribing to this Errors Observable, we know exactly when an error occurs. Let's now see how we could implement an immediate retry strategy using the Errors Observable. In order to retry the failed observable immediately after the error occurs, all we have to do is return the Errors Observable without any further changes. Let's remember, the Observable that we are returning from the retryWhen function call is the Notification Observable! The value that it emits is not important, it's only important when the value gets emitted because that is what is going to trigger a retry attempt. As we can see, the HTTP request failed initially, but then a retry was attempted and the second time the request went through successfully. As we can see, the second attempt was issued immediately after the error occurred, as expected. Let's now implement an alternative error recovery strategy, where we wait for example for 2 seconds after the error occurs, before retrying. This strategy is useful for trying to recover from certain errors such as for example failed network requests caused by high server traffic. In those cases where the error is intermittent, we can simply retry the same request after a short delay, and the request might go through the second time without any problem. To implement the Delayed Retry Strategy, we will need to create a Notification Observable whose values are emitted two seconds after each error occurrence. As we can see, the first value 0 will be emitted only after 3 seconds, and then we have a new value each second. Notice that the second argument is optional, meaning that if we leave it out our Observable is going to emit only one value (0) after 3 seconds and then complete. This Observable looks like its a good start for being able to delay our retry attempts, so let's see how we can combine it with the retryWhen and delayWhen operators. 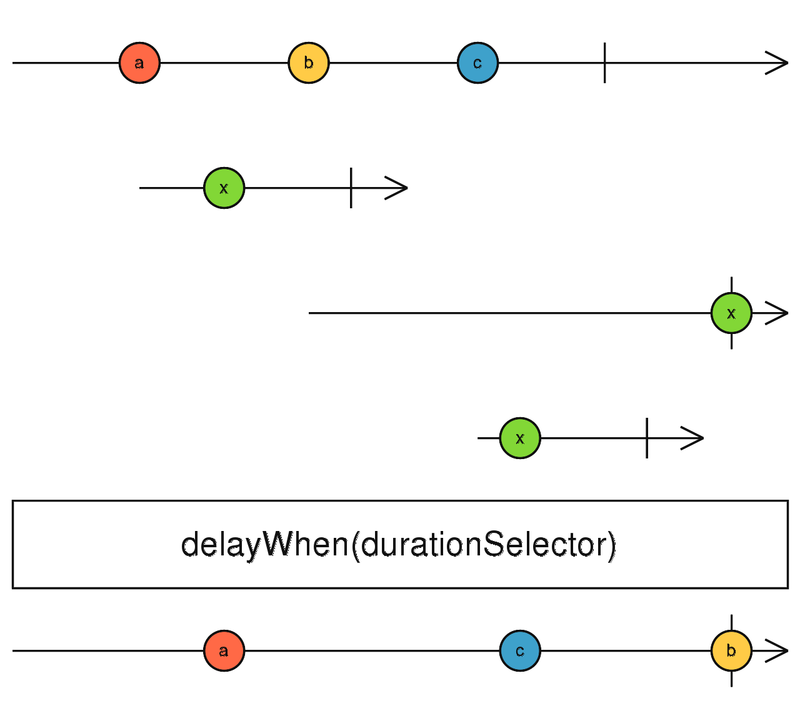 One important thing to bear in mind about the retryWhen Operator, is that the function that defines the Notification Observable is only called once. So we only get one chance to define our Notification Observable, that signals when the retry attempts should be done. We are going to define the Notification Observable by taking the Errors Observable and applying it the delayWhen Operator. As we can see, the retries only happened 2 seconds after the error occurred, as expected! And with this, we have completed our guided tour of some of the most commonly used RxJs error handling strategies available, let's now wrap things up and provide some running sample code. In order to try these multiple error handling strategies, it's important to have a working playground where you can try handling failing HTTP requests. As we have seen, understanding RxJs error handling is all about understanding the fundamentals of the Observable contract first. We need to keep in mind that any given stream can only error out once, and that is exclusive with stream completion; only one of the two things can happen. In order to recover from an error, the only way is to somehow generate a replacement stream as an alternative to the errored out stream, like it happens in the case of the catchError or retryWhen Operators. 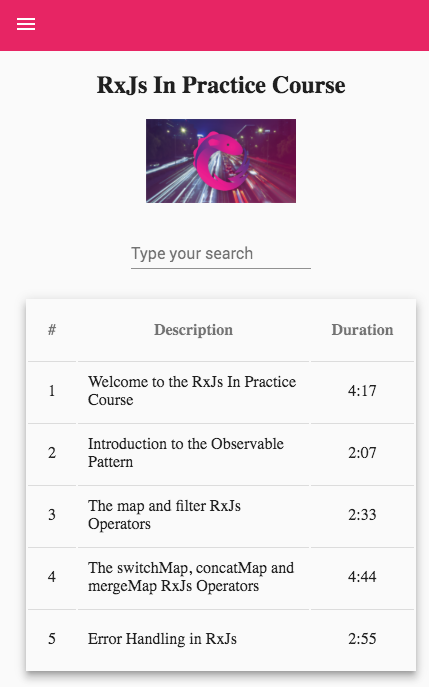 I hope that you have enjoyed this post, if you are looking to learn more about RxJs, you might want to check out our the other RxJs posts in the RxJs Series. Also, if you have some questions or comments please let me know in the comments below and I will get back to you.